Has it really been eight years since my last DSE run? It was with a slight bit of anxiety (and some embarrassment) that I approached the table at the South Embarcadero Run. So much has changed, so I thought. Would anyone remember me after all these years away? Right off the bat and as if to allay my timidity was an eyesore from the old days, a DSE denizen…Kevin Lee (aka Peking Duck). He greeted me as if he had seen me everyday. Then in quick succession I espied the two Bob’s – Theis and Brizuela – as well as Ted and Bernice Vincent. It was as if I hadn’t been away at all! And as the runners continued to come in I saw Jim Pommier, Fred Haber, Tony Stratta, and Stu Etzler for crying out loud! Oh, how I had missed the camaraderie of my fellow DSEers. My eight-plus year estrangement began with a divorce, then was complicated by living on Nob Hill (unable to use my car for transportation to DSE runs), an office move to San Ramon, the death of my former wife, a relatively severe knee injury, and subsequent surgery. Suffice it to say, it had been a pretty hard number of years. But now I was back – albeit older but hopefully wiser, and slower but heavier. But I found that the DSE was basically the same group. Our ranks have been thinned a little by the ravages of time which have affected my friends as much as it has me. The news bulletin is a little more professional looking than the one I remember during my tenure as Race Results Manager. Race results are recorded a bit more professionally as well. Gone are the numbered IBM cards and labels, and times are no longer recorded by hand along with a stop watch and a clipboard. The GGNRA and the other bureaucrats of the City are hitting the club harder than ever with “use permits”, and draconian fees for using City streets and parks. But for all that has changed there is much more that has remained the same. 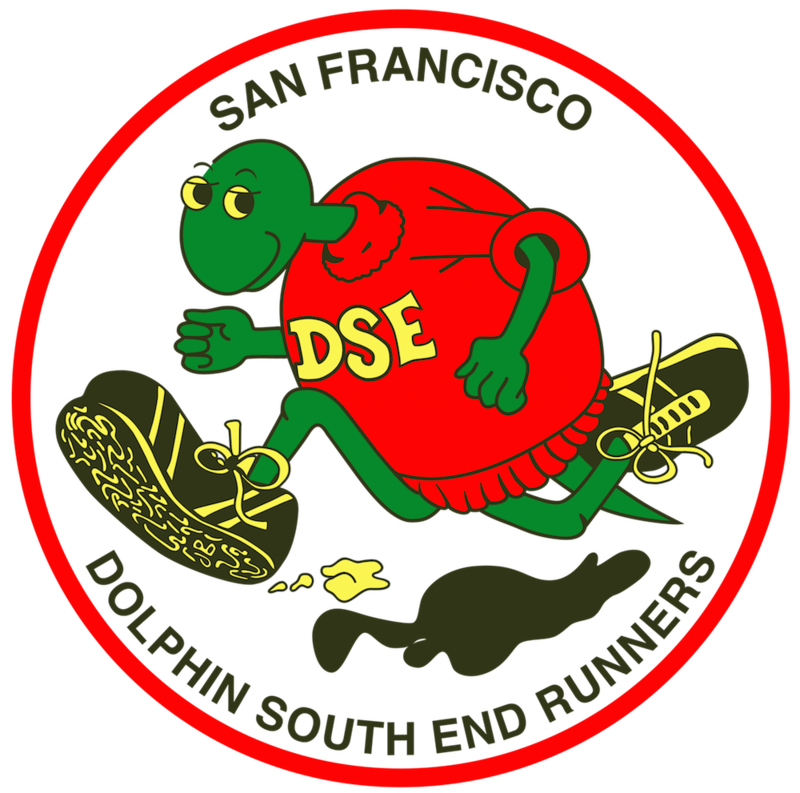 The DSE has retained its informal, low-key charm and acceptance of runners of all abilities. As the club’s ranks have grown, new races have been introduced, and former races re-introduced as fun runs. Ribbons are still given out and the fees for the runs are still the same. The Club still has trouble getting people to run for office. (Runners tend to be a rather laissez-faire, ungovernable lot). Another subtle change to the club is the loss of some of the more colorful runners’ sobriquets in the results: “Throbbing Gristle”, “Agent Orange”, “Onomatopoeia p” (who are/were these people anyway, or were they all the same person?) There were others whom we all knew: “Yokohama Mama”, “Papa Duck”, “Mama Duck”, and the aforementioned “Peking Duck”. And, as solicited in Joe Oakes’ article (DSE News, Nov. 2000), the memories! My best and fondest memory of the motley collection of street urchins, ragamuffins, and ne’er do wells collectively known as the Dolphin South End Runners is of the infamous Bay to Breakers Practice Run, a romp across the City by upwards of 800 runners following the Bay to Breakers course – without the assistance of 3,000 traffic monitors and uniformed police! As an example to the uninitiated, try crossing Van Ness Avenue against the light! There is a small degree of “herd immunity” in a screaming band of 50 runners crossing Van Ness together. Another vignette is Walt Stack’s annual tradition of placing a beer bottle in the hand of one of the figures in the sculpture in the parking lot at the Palace of the Legion of Honor. Well, after a protracted absence, I have returned. And I look forward to many more years of memories, fun and friendships (both new and renewed), running (and eventually walking!) with the DSE!